We welcomed our daughter, Audrey Emerson on March 13th - weighing in at 6 lbs 14 oz and 19.5 inches long. Whoop whoop! I know as a first time parent, you sort of guess at what your baby will really need when you bring them home. She is now 4 weeks old (WHAT?!) so here are our must-haves from her first month of life. 1. 4 Moms bath tub and The Motherhood Collection wash cloths - We had originally ordered the Angelcare Bath Support tub but quickly realized that it didn't work with our bathroom/bathtub set up. Luckily we also had the Blooming Bath given to us by a friend so we used that for sink baths for awhile. In the meantime, I ordered the 4 moms tub and Audrey loved it. It's a little big, but works perfectly for what we need. Also the Motherhood Collection washcloths are amazing, I can definitely see why they have amazing reviews on Amazon. They are the perfect size and insanely soft. 2. Pigeon nail scissors - These were recommended by a friend who said they are her go-to gift at baby showers. I ordered some and oh boy, do they take the stress out of cutting tiny baby nails. Do yourself a favor and get these, for sure. 3. Green Sprouts Muslin Burp Cloths - Our daughter is a spitty one. I had originally ordered only one pack of these burp cloths, but loved them so much I literally ordered three more packs from Amazon and threw out the Burts Bees burp cloths we also had. They are big, absorbent, and wash really well. Don't bother with other burp cloths and just get these ones. 4. Pampers Swaddlers - our petite little princess doesn't quite fit into most newborn sized diapers. I had ordered some packs from Honest, Bambo, Parasol, and Seventh Generation to see which ones we like best - but the only ones that fit her now are the Pampers Swaddlers. Amazon seems to have the best price for these. 5. Kickee Pants Footies - Since Audie was under 7lbs at birth, none of the 0-3 month clothes we have for her fit. So I quickly ordered 5 pairs of Kickee Pants footie PJ's in size Preemie (4-7lbs) and its all she wears pretty much. Side note - bamboo fabric is delicate. I'd suggest not putting yours in the dryer so the material holds up longer. 6. Swing - A God send. If you don't have a swing, add it to your registry. She takes almost 100% of her naps in her swing downstairs and we LOVE it. She also has a little bit of reflux, so the incline helps her little tummy. I don't know what we would do without the swing. We got the Fisher-Price Moonlight Meadow Cradle 'n Swing. 1. Spectra S1- Speaking of pumps, I was lucky enough to actually have two breast pumps at home before Audrey was born. A Medela and a Spectra. 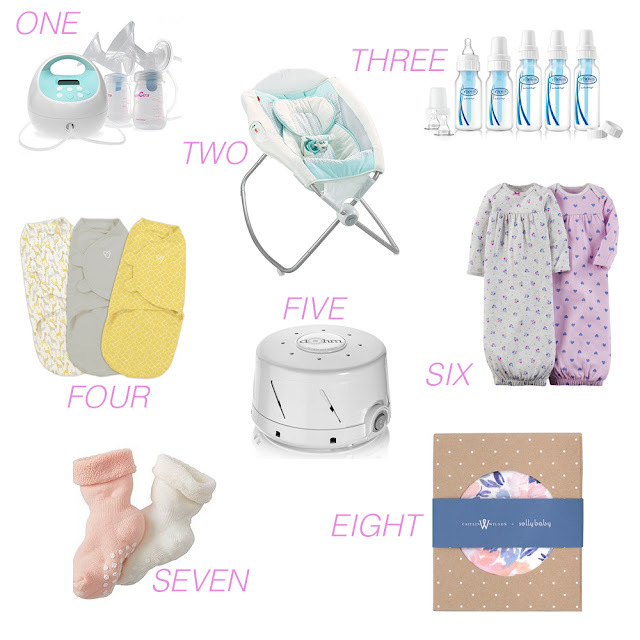 Initially I used the Medela and it was fine, but upon reading a few glowing reviews of the Spectra, I decided to switch and haven't looked back since. The Spectra is small, light weight, quiet, has a nightlight (!) and has a rechargeable battery inside so I can pump without an outlet if needed (and I have pumped in the car now twice, so it comes in handy!). Plus I honestly think it gets milk out better than the Medela. I still use the Medela pump parts, just ordered this little gadget to make it connect to the Spectra tubing. 2. Rock n Play - So we had planned on using both our Halo bassinest and the Dock A Tot for Audrey's sleep time, but then we realized she has reflux and sleeping flat was making her throw up a ton. I was washing the Dock a Tot cover literally every day because she spit up on it so often. It was stressful for me to hear her in the middle of the night puking, so one night we decided to put her to sleep in the Rock n Play instead since it is slightly inclined. OhEmGee. She went right to sleep and had very minimal spit up. We ordered this one and highly recommend the auto rock n play version. 3. Dr. Brown glass bottles - Audrey wasn't gaining weight appropriately (and had jaundice) so despite my original plan to not pump until she was a month old, I had to start pumping after every feed starting the first week of her life. Thank goodness I already had these Dr. Browns glass bottles. She loves them and they help with her reflux. Even if you are planning on exclusively breastfeeding, save yourself some stress and have a few bottles on hand ahead of time - just in case you need them really suddenly. 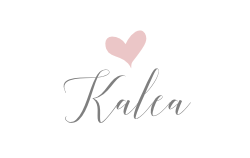 It was honestly such a relief to already have bottles that we loved at the house when we needed to supplement with additional breastmilk instead of having to run to the store and figure it out then. 4. SwaddleMe Swaddles - I've got a baby who likes to be wrapped up tight to sleep. If she's tired and not swaddled, she will loose her mind. Ha. 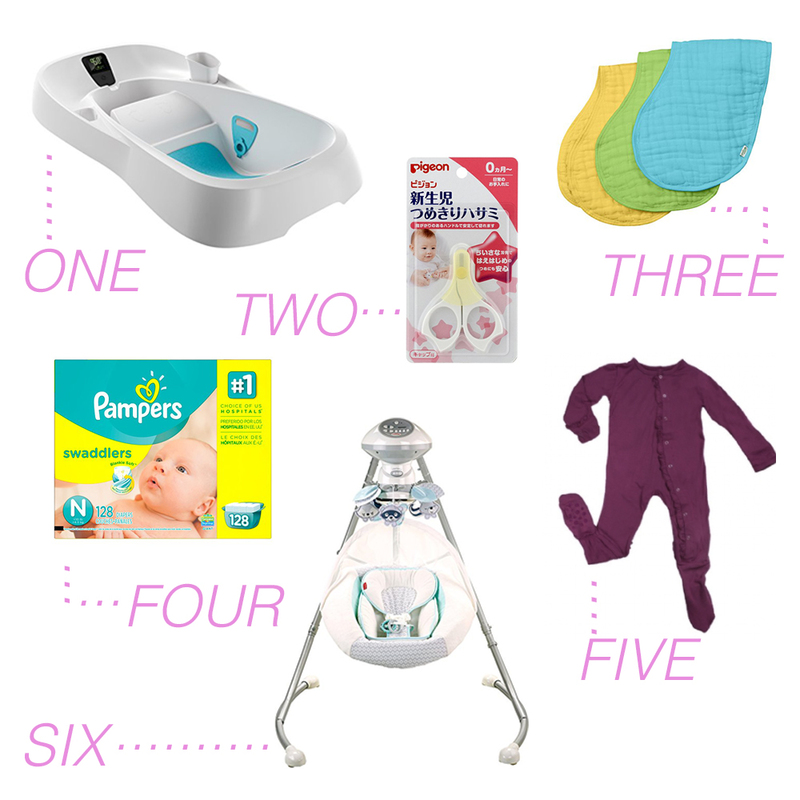 So, order at least three of these (if not more) in case your baby spits up a lot like ours, they will constantly get dirty and be in the wash. We currently have 5 in the rotation and that seems to be a good number. 5. Dohm white noise machine - Audrey sleeps so much better with some white noise. For example, last night she was incredibly fussy and then Nate started vacuuming and she fell asleep in my arms. So, do yourself a favor and order this noise machine. Ours is on my bedside table and we have it on every night. Well worth the money. 6. Sleeper gowns from Carters- These make middle of the night diaper changes a breeze, so Audrey sleeps in them every night as her PJs. The inexpensive Carters ones are my favorite, although we also have a few from Kickee Pants as well. 7. Baby Best Ever First Socks - these are expensive little baby socks but I promise, well worth the money. They actually stay on her tiny feet and have since day one. 8. Solly- I knew this would be a must have, so I can't emphasize it enough - get a Solly wrap! Audrey loves them, they pack easily in my diaper bag, and we use ours all the time for on-the-go naps. I've wrapped her up every time we have eaten out at a restaurant and she snoozed the whole time. WIN. And that's pretty much what we use every single day her first month of life!